Chelsea's win at Leicester kept the chasing pack at arm's length, but it is now Tottenham who are second after their victory over West Brom. Liverpool dropped to third on goal difference following their draw at sixth-placed Manchester United, while Arsenal are fourth after victory at Swansea. Manchester City were thrashed by Everton and have dropped to fifth, while there were also important wins for West Ham and Hull City. The save from Zlatan Ibrahimovic's free-kick was good but the stop from Henrikh Mkhitaryan was even better. Simon Mignolet has had to fight to regain his first-team place at Liverpool, but since his return the keeper has looked good. His decision-making seems to have improved and he appears less frantic. Mignolet has always been a good shot-stopper but I have felt he is prone to come for a cross he is not entitled to get, or rush out of his penalty area in a vain attempt to get involved only to complicate matters. However, none of that seemed relevant against Manchester United. He caught comfortably from corners, punched brilliantly when he had to under pressure and allowed centre-back Dejan Lovren to do his job without any interference. I have been very critical of Liverpool's defence this season, but I must say they were impressive against Manchester United. These new formations that are being so liberally introduced, mostly by foreign managers, are providing such freedom for certain players that their performances have been transformed. I couldn't tell if Kyle Walker was playing right-back or right-wing. There was even one occasion when he looked like he was actually playing up front. There is no doubt that a back three releases the full-backs to go forward - that's if the defender can play with the ball at his feet of course, which is just as well because Walker loves to get involved. Spurs are looking good at the moment, and so is Walker. Did anyone see the ball Toby Alderweireld played for Kyle Walker in the first half? Sadly, the move came to nothing but that wasn't the point. This player has been absolutely fantastic for Tottenham this season in every conceivable department. I admit West Brom weren't at their best, but Alderweireld still had to deal with the threat of Matt Phillips and Salomon Rondon. I could have selected David Luiz, Gary Cahill or Cesar Azpilicueta for Chelsea's impressive clean sheet away at Leicester in difficult circumstances, but what I find extraordinary about Alderweireld is that his performances often go unnoticed. 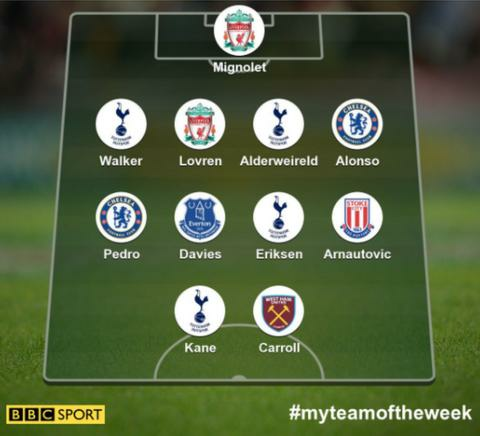 Well, not so here, and he makes my team of the week once again. I thought a draw was a fair result but if Liverpool had left Manchester United with all the points I wouldn't have complained. The way they defended against Jose Mourinho's side's second-half aerial bombardment was admirable - and the man at the heart of that scrap was Liverpool centre-back Dejan Lovren. United had run out of ideas at this stage of the match so resorted to Mourinho's favourite tactic - the long ball game made famous at Chelsea during the Didier Drogba days, although for some reason the label has never really stuck to Mourinho. Nevertheless, Lovren marshalled his troops around him brilliantly and, if Liverpool can defend this well in future matches, I may have to revise my position on where they might finish. What a stunning performance from the full-back. His first goal with his right foot was sensational and his second with his left wasn't bad either. Alonso is almost unrecognisable from the player I saw at the start the season. He has made my team of the week before, but I have never seen a full-back go hunting for his hat-trick. His performance against Leicester just exuded confidence and the player grew in stature with every second. In fact, he was unlucky not to get his treble. In contrast, I think the behaviour of Chelsea striker Diego Costa has been despicable, not least because he appears to have let his team-mates down in the middle of a serious title challenge, which his shenanigans have now put at risk. I have no problem with a professional footballer wanting to leave to triple his wages - but the way it has alleged to have been done is totally unacceptable. Thank goodness Chelsea have individuals in the team like Alonso who at the first sign of interest from elsewhere matched with an obscene amount of money don't just down tools. There has to be a better way of professionals conducting themselves than that. Pedro has won every trophy a player could win for club and country, but I can't remember when I have seen him play better for a team or look as comfortable as he currently does with Chelsea. Blues manager Antonio Conte played a masterstroke against Leicester by using Willian, Eden Hazard and Pedro up front in order to replace Diego Costa - but the reaction from Pedro, in particular, was immense. He seemed to grow in stature in the absence of their rebellious centre-forward and played accordingly. As for Costa, his problem is no longer with his manager, who must feel terribly let down by the striker, but his team-mates. It's one thing having a dispute with your manager and club, but when you have to go into the dressing room and face your team-mates when they have put themselves on the line for you it is a very uncomfortable experience. I for one hope the Chelsea players don't make it easy for him. This was a massive result for Everton manager Ronald Koeman, particularly after his side's ignominious FA Cup exit. I said a few weeks ago that something wasn't quite right at Goodison Park and it probably needed something from the January transfer window to fix it. In the meantime, Koeman has put his faith in a teenager by the name of Tom Davies. A young, local lad whose performance against Manchester City was way beyond his years. Everton have a history of unearthing local talent and, although I don't see a Wayne Rooney, I do see a player who has blue blood running through his veins. On the other hand, Pep Guardiola's Manchester City are struggling and Manuel Pellegrini (remember him) must be crying with laughter. City's lack of fight when they went behind was so conspicuous it was scary and, if they have any chance of winning the title - and I don't think they do - they need players with desire to match their obvious talent. Spurs boast a long and successful history of fielding some extraordinary midfield players. Paul Gascoigne, Luka Modric, and Glenn Hoddle - the king of White Hart Lane - immediately spring to mind. However, whenever I watch Christian Eriksen I see the most delightful player. Eriksen doesn't possess the combustible temperament or mischievous nature of a Gascoigne, or the artistry of a Modric or Hoddle - but what he does display all over the pitch, and with great alacrity, is a dignified football authority with which he absolutely destroyed West Brom. The season started slowly for Eriksen but, interestingly enough, Tottenham's success in recent weeks totally correlates with his return to form. I've seen Marko Arnautovic in this mood before and he can be devastating. In fact, Sunderland should have read the early warning signs. This was a 45-minute blitz by Stoke and Sunderland never recovered. It wasn't only Arnautovic who impressed me against the Black Cats. Rejuvenated Stoke City striker Peter Crouch - who, by the way, has been playing brilliantly since his return to the Potters line-up - did too. It was the link up play between Arnautovic, Xherdan Shaqiri and Crouch that ultimately destroyed Sunderland. A note of caution for Sunderland boss David Moyes, however. I couldn't help but notice an air of discouragement about Jermain Defoe's performance against Stoke. The last thing the Black Cats need is a disillusioned Defoe. If they lose him they really are sunk. At last, Harry Kane is well and truly over feeling somehow responsible, wrongly, for England's miserable Euro 2016 performance and is back to his best again. Often the price for playing for your country is the effect it can have on your club form. However, West Brom were trounced by Spurs, who have paid the Baggies and Chelsea back with interest after those two teams were directly responsible for the demise of their title challenge last season. Spurs played some lovely football against both teams, but the star of the show against West Brom was, without doubt, Kane. Normally when you score a hat-trick it doesn't get much better than that - but when he has seen the birth of his first child in the same week, I'm beginning to think this might be Harry Kane and Tottenham's year. What is it with players these days? They sign a new contract, take the bonus and then renege on the agreement. Thank goodness West Ham can rely on Andy Carroll because it seems they can't rely on Dimitri Payet. Everything was stacked against West Ham as they took on an equally desperate Crystal Palace. Playing at home in London Stadium can't be much fun when your fans are so far away they feel as though they are watching the game from the car park. Nevertheless, the Hammers did actually manage to muster some atmosphere in this makeshift football graveyard thanks to an outstanding performance from, unlike Payet, the totally committed Carroll. If only the striker could remain fit between now and the end of the season no-one would give a fig about Payet, as good as he is. If Carroll's post-match interview is anything to go by Payet would be wise to keep a low profile at the training ground next week. It would appear players like Carroll don't take kindly to team-mates who take the money and then run. Weekend stats breakdown: Who's the Premier League's unlucky charm? Read more on Weekend stats breakdown: Who's the Premier League's unlucky charm?